Chabad will be hosting a full schedule of events during graduation weekend: Friday night services and dinner, Shabbat services and lunch, Shalashudis and a Sunday open house brunch. We look forward to welcoming you all! To congratulate your child in the special graduation issue of Hakesher Magazine, Chabad's cutting edge periodical click here. 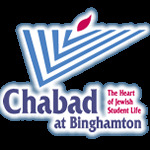 All are welcome to join in Graduation Weekend festivities and there is no fee, but contributions to Chabad of Binghamton are greatly appreciated and allow us to cover the expenses for this weekend and continue our vital work at Binghamton University.